It was truly inspirational. To hear the urgency, passion and anger in the voices of the young people was a stark contrast to the traditional climate denial and new climate denial that dominates the mainstream climate policy debate. Further, the environmental and climate justice analysis, as well as commitment to gender, class and racial equity of these high schoolers is light years ahead of where I was as a teenager. The kids call this analysis intersectionality. There is increasing evidence that the climate crisis is taking the largest toll on vulnerable populations – including those in developing countries, people in poverty, Indigenous peoples, migrants and other marginalized groups. Understanding this is foundational for climate justice, and the youth at the Climate Strike get the picture. For many of us, the inclusive and celebratory nature of the school strikes was somewhat overshadowed by the shocking news that morning of the Christchurch mosque terror attacks, where 50 innocent people were murdered by an anti-immigrant white supremacist in what can only be described as an act of terrorism. This heartbreaking tragedy was a reminder of how far we still need to go in combating racism and white supremacy. You may be wondering why we are discussing racism on an environmental law blog. Well put simply, environmental justice, climate justice and migrant justice are inextricably connected. Climate change is already one of the biggest causes of massive displacement and migration around the world. Indeed, the Syrian refugee crisis has been linked to the years of drought that helped trigger the civil war that led to the refugee crisis. Climate change causes social and economic instability that can lead to larger conflicts and mass migration. Much of the displacement and migration happens within borders, whether in Bangladesh or in BC. In 2017, 85,000 people were relocated due to wildfires and extreme weather in Canada. And as forest fires, floods, droughts and storms become worse, that number will only increase. Migration is natural and all migrants have human rights. That alone should be enough for Canadians to be accepting of migrants, particularly since anyone who isn’t Indigenous to the land we call Canada is a migrant or a descendant of migrants. In addition, along with other wealthy countries from the global north, we have an even greater responsibility to welcome migrants because Canada has burned more than its fair share of the globe’s climate budget. Canadians have consistently been among the top greenhouse gas emitters per capita for a long time. In other words, each individual Canadian has made an outsize contribution to the climate crisis, relative to our small population size. And as mentioned, in Canada and around the world, those who have done the least to fuel climate change, (Indigenous communities, people of color, and the poor) are usually the worst hit by its impacts. What do we owe people displaced by climate chaos – or whose communities have been destroyed by industrial development, like the injustices committed by Canadian mining companies? As a rich country, doing our fair share to address the global ecological crisis certainly requires slashing emissions at home (with far more ambition than we have mustered so far). It also means welcoming migrants and refugees to Canada, offering pathways to status for migrants already here, and – equally important – helping to finance climate transformation and preparedness in the global South. After all, most of us don’t want to leave our homes if we aren’t forced to do so. Both climate and migrant justice require helping people to stay and thrive where they are, or to have the real option of returning home. Canada’s burgeoning yellow vest movement reared its ugly head last month when the United We Roll pro-pipeline convoy also brought anti-immigrant messages consistent with far-right populism around the world. If this is a battle between pro-pipeline racists, and anti-pipeline migrants, I know which team I’m on. If you care about climate change, then you should care about migrant justice. 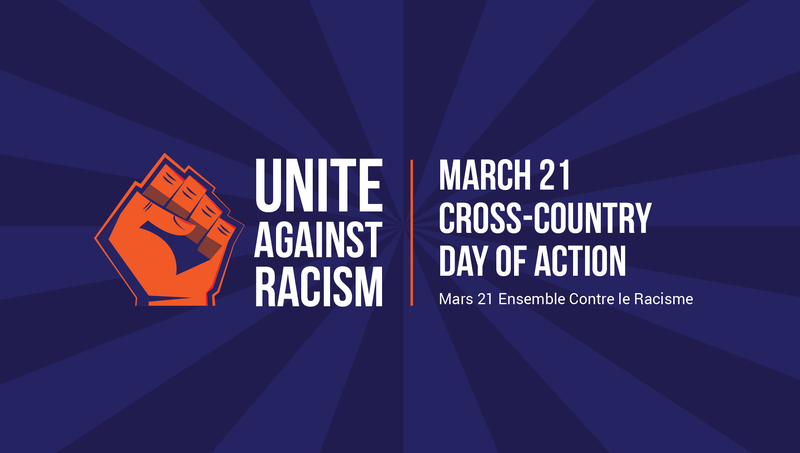 That’s why we are inviting our supporters to participate in a national day of action on March 21, the International Day for the Elimination of Racial Discrimination. On March 21, 1960, police opened fire and killed 69 people at a peaceful demonstration against apartheid pass laws in Sharpeville, South Africa. In 1966 the United Nations General Assembly called on the international community to mark this day with a commitment to end all forms of racial discrimination. The day of action, organized by Canada’s Migrant Workers Alliance for Change and the Migrant Rights Network, will have events across the country. In Coast Salish Territories, the #UniteAgainstRacism event will take place from 6-8pm in the Alma VanDusen Room, at the Main Branch of the Vancouver Public Library (350 West Georgia Street, Vancouver). Click here to find a list of events in different communities. The climate crisis affects everyone, but it disproportionately affects those who are least responsible for climate change and most vulnerable to the impacts. In order to achieve the scale of change that is needed to address the crisis we need to reach out beyond our silos and issues, because they are all interconnected. Environmentalists must unite with other allies, like Migrant Justice organizers, to inject climate action with an anti-racist analysis – and present a strong vision of how tackling multiple crises at once will make our economy and society better for all.